Research models are often engineered to help answer a narrow set of experimental questions; however, cross-breedings and other experimental interventions allow investigators to dramatically broaden the utility of transgenic mouse models. This is particularly true for models with strong and relatively easy-to-monitor phenotypes, two properties which support a potential platform for multiple rapid discoveries. One such example is the human TNFα mouse: a transgenic mouse that over-expresses human TNFα and spontaneously develops arthritis without any experimental manipulation. The human TNFα transgenic mouse expresses a 2.8kb fragment of the human TNFα gene fused to a modified 3' UTR (untranslated region) regulatory unit, resulting in the expression of constitutively low TNFα during development. This model spontaneously manifests inflammatory bone-loss and a form of arthritis that is very similar to human rheumatoid arthritis (RA), as such allowing the TNFα line to serve as an excellent model for human RA and osteoporosis. The TNFα model displays 100% incidence of disease, over a predictable time-frame, requiring no experimental intervention. Complementing these experimentally-desirable traits are the uncomplicated assays used to quantify disease progression; for example, the arthritic-phenotype can be visually quantified without sacrificing the rodent, enabling use of the model with in vivo screens. Furthermore, disease progression can be monitored by highly-reproducible histopathology of immune cell infiltrates and by immunoassays for inflammatory cytokines. In recent works, investigators have adapted the TNFα model to successfully identify potential new targets for the treatment of osteoporosis and RA. Lin and colleagues applied a bone marrow transfer approach to the TNFα model, which helped identify a novel role for autophagy in osteoclast differentiation and bone resorption. Mukai et al. crossed the TNFα model with a mouse lacking the gene encoding SH3BP2, resulting in diminished bone-loss and osteoclastogenesis (relative to the TNFα mouse), and suggesting SH3BP2 as a target for RA therapies. Notably, the TNFα model also played an important role in identifying Wnt-4 as a potential therapeutic agent for treating osteoporosis. Yu and colleagues generated a mouse with osteoblast-specific and constitutive expression of the secreted protein, Wnt-4, then crossed this line with the TNFα mouse. 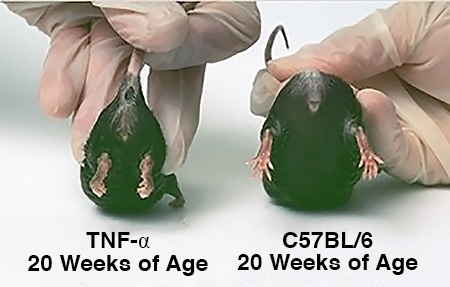 The resultant double-transgenic mice displayed decreases in joint swelling, bone erosion, and inflammation vs. comparably aged TNFα transgenic mice. Additionally, compared to the TNFα mice, the TNFα/Wnt-4 mice had significantly greater osteoblast counts, reduced markers of osteoclast activity, and reduced serum-levels of inflammatory cytokines. In continued experimentation, the investigators identified NFκB (a transcription factor generally activated during inflammatory processes), in macrophages and osteoclast-precursors, as an indirect target through which Wnt-4 elicited its beneficial effects. The above examples illustrate the utility and extensibility of rodent models that display strong phenotypes which can be monitored by an assortment of techniques. In the TNFα mouse, the grossly observable arthritic phenotype enables various screening approaches (e.g. cross breeding or administration of a potential therapeutic agent), which can be coupled to straight-forward histological, cytological, and enzymatic assays to gain further mechanistic insights.